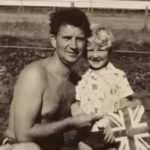 My Dad, Freddie Robertson, worked at Harris Lebus at the Tottenham Hale factory from around 1955. I am not sure but I think he was a sprayer originally in the factory. Later, because he was a qualified French polisher (did his apprenticeship on pianos in Hackney or Upper Clapton). He then became the travelling repair man. So any damage that may have occurred in transit or something the customer noticed after purchase. Dad would arrive at the private or business premises to repair the furniture. He used to take me with him sometimes in the school holidays… I absolutely loved going with him, would have been around 1963. I remember he told me after Lebus closed he had a job polishing the banister staircase hand rail at the American embassy in London. He was extremely well respected for his ability to restore antiques and dealers from all over London would bring items to his workshop for restoration. 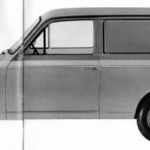 Freddie had a small grey Viva HA van similar to the picture below. Frediie died quite young at only 66, we still miss him very much.